The carotid body consists of two types of cells: glomus cells, chief cells or type I cells and sustentacular cells or type II cells. 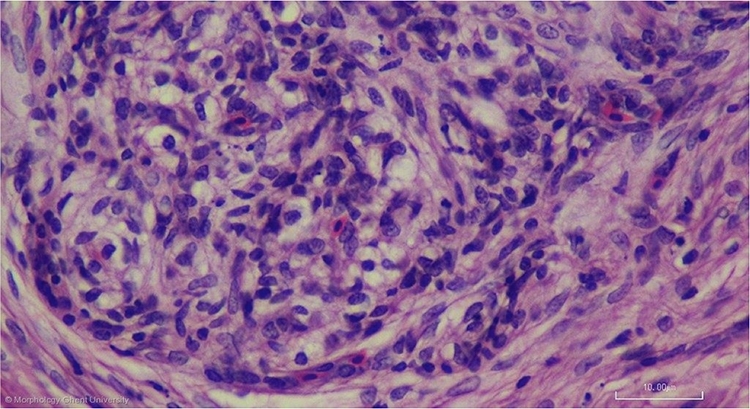 The glomus cells are large epithelioid cells with an argyrophil granular cytoplasm and pale vesicular nuclei. They are gathered in small cell groups that are surrounded by sustentacular cells. The latter are smaller, flattened agranular cells with dark nuclei and cytoplasmic processes. Sustentacular cells act as schwann cells that envelope nerve fibers that connect to the glomus cells.